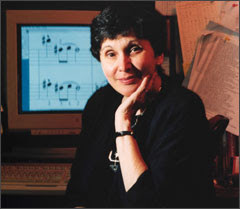 The Delaware Chamber Music Festival devoted their June 26 concert to Sylvia Glickman, pianist, composer and advocate for women’ music who died in 2006. Charles Abramovic played Glickman’s Dances and Entertainments with insight and gave singular character to each vignette. Glickman would no doubt have applauded the commission the DCMF gave Ingrid Arauco, an associate professor at Haverford College. Divertimento is “light, not long for a summer evening. You can look at the pieces as five little experiments, five little essays,” said Arauco. Frank Ferraro played his trumpet delicately, giving Barbara Govatos, violin and Yumi Kendall, cello ample room for dynamic variation and expression.